After coming to know all the things you get to know when you become a therapist that specializes in working with children there is an invitation to look back on what you did as a mom and realize that it was awful sometimes. The truth is this; I did the best I could. Sometimes I was good, and kind, and attentive, and sometimes I was emotionally triggered and over-reactive and not very helpful. This is it. This is the game. And, if that is what it looks like in your house I am here to tell you that you are winning. I don’t know who owns the minivan that displays this sticker, I just saw it in a parking lot one day, but I do know that I want to give her a huge high-five. And a hug (and I am not much of a hugger). 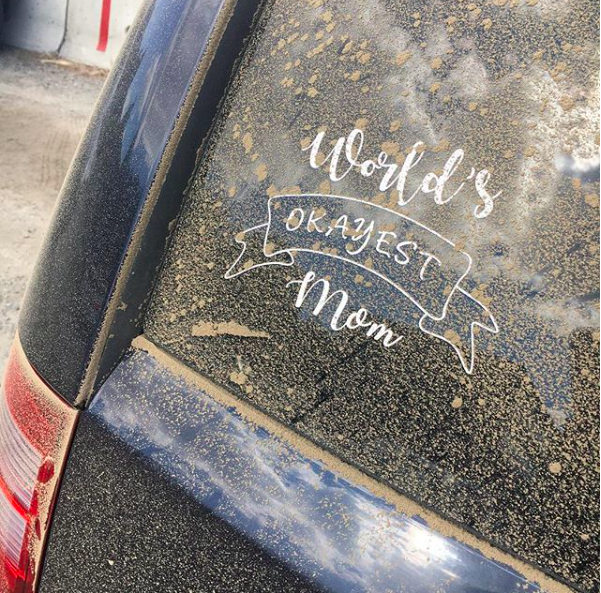 Partly, for boldly owning the imperfection of parenting and partly for the dirty minivan. So many things are more important than washing the van. You see, children thrive when they have attuned, loving attention from a trusted adult. Attunement from another helps us learn to be kind, loving humans and sends the message that we are loved, and lovable, and important. These are necessary things to know to build a meaningful life in this world. I think of attunement as a kind of attention that is focused on the present moment, warm, and connected with an air of love and acceptance. Attention can become attunement when a caring human is regulated and feeling open-hearted. That means that all the moments that I was thinking about the grocery list, or how two kids had soccer practice AT THE SAME TIME AT TWO DIFFERENT FIELDS, and how my husband annoyed me earlier (or most of the time) were NOT moments that my children got a message about being loved or lovable or important. Then I learned, one of the biggest things I have learned in all my therapist learning. Ready? Here it is: Recent research states if a parent can provide attuned, loving attention 30% of the time the kids are alright. 30% of the time. 30%! I didn't need to do things right all of the time, some of the time is totally good enough. I am off the hook! You, you over there … get off the hook. There is SO much pressure to do things right, to pick the right school, or make the right lunch, to allow the right shows or amount of screen time or no screen time or too much screen time, and to discipline this way or that way or no way. There is so much pressure to be doing this parenting thing perfectly. Stop. Just stop all the thinking about all the things that you should do or know. You are doing a great job and the less time you spend worrying about having the right this, or the wrong that, is more time you can spend open-hearted, and being with what is happening, instead of feeling like it should be different. More time spent contributing to that golden 30%. Of course, you can’t just check out and watch Netflix the other 70% of the time, but if you are around and mostly nice-ish your kids are getting what they need. Imperfectly perfect is where it is at. What a relief, right? This mom right here, that did Okay, is raising her cup of herbal tea to you because you are doing Okay too and that is all you need to do. We are good enough parents. s212 - 750 Cottonwood Ave.